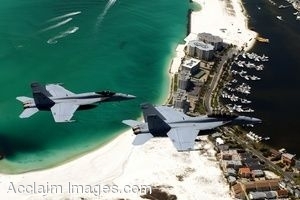 Description: Clip art photograph of naval Aviators assigned to Air Test and Evaluation Squadron (VX) 9, China Lake, Calif., flying F/A 18E and F/A 18F Super Hornets over the beaches near Eglin Air Force Base. (U.S. Navy photo by Cmdr. Ian C. Anderson.) Clipart photograph by Department of Defense Public Domain.